Sometimes I dream about visiting Morocco – the spice markets, the colors, the architecture. I don’t really know all that much about Morocco except for the food: spicy, aromatic dishes that warm your insides. This recipe utilizes seasonal summer veggies (favas, yum!) and spicy merguez lamb sausage. The merguez is everything – make sure it’s good! In a large saucepan, melt 1 tbsp of butter and a little bit of olive oil, and sautee the red bell pepper and zucchini until lightly browned. Remove. In the same pot, melt the other tbsp of butter and sautee the onion until soft, then add the merguez sausage and brown evenly. Add the turmeric, cayenne, tomato, broth, water, cinnamon, bay, cumin and paprika, bring to a boil then lower the heat and simmer gently uncovered for 20 minutes until you have created a flavorful broth. Ladle out 1 ½ cups of the broth and place it in a smaller pot. Return the zucchini and bell pepper to the large saucepan and add the fava beans and put on a low simmer, salt and pepper to taste. Bring the 1½ cup of broth to a boil, turn off heat and stir in couscous. Let stand off heat 5 minutes. To serve: Fluff couscous with a fork and pour it out onto a serving plate. 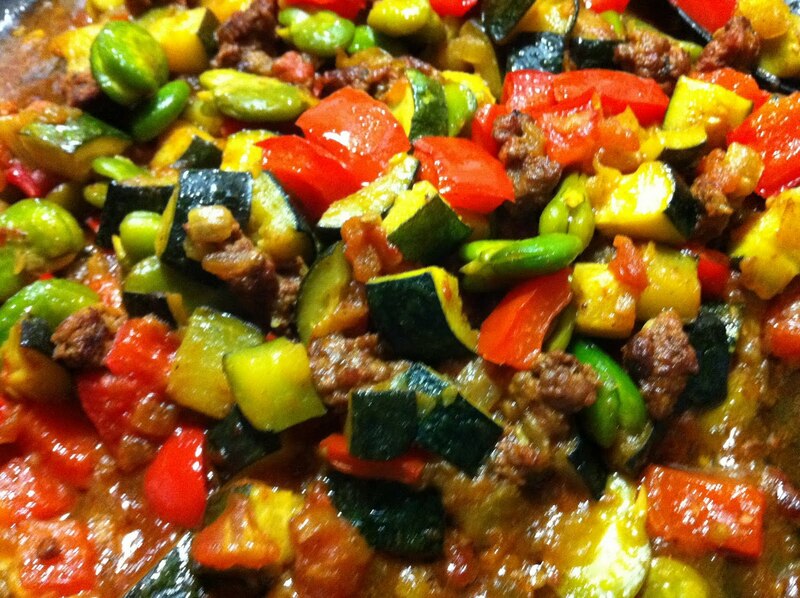 Make a large well in the center and pour the merguez-vegetable stew into the center. Thanks for the link, lady!! !